A handful of new photos over on Flickr, including one of Heart REFUSING to share the bed, and the cutest squishy face photo of Jelly Bean ever taken. A HUGE puppy mill just north of Montreal has been busted. I mention this here, because one or two people I’ve spoken to have mentioned that they were going to Montreal to look at French Bulldog puppies. I’ve since heard that this is apparently the same place some of them visited. I’m told it wasn’t a pretty scene, and that the dogs were in abysmal shape, even the ones being trotted out for viewing by buyers. There were at least five or six French Bulldogs there, both adults and puppies. This is on top of the English Bulldogs, poodles, and numerous other breeds also rescued from this tiny corner of hell. HSI and CSPCA rescuers were able to save 110 dogs, seven cats and one rabbit from this overrun breeding facility. 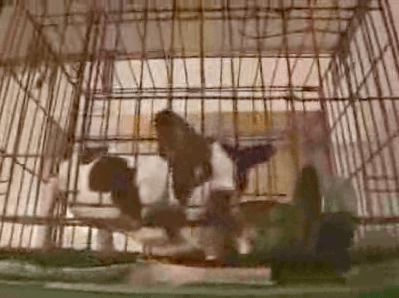 The dogs, ranging from Boston Terriers to Dogs de Bordeaux, were living in piles of their own feces, and many were suffering from obvious medical conditions such as open sores and severe skin conditions. Skeletal remains were found still locked in cages inside the home, and a pile of burned animal remains was found in the rear of the property. The CSPCA is in DESPERATE need of funds to help care for these dogs. We ask that you consider making a donation. We’ve already made one, in the name of Heart and the Nellkins. By the way, did you know that you can help with situations like this, even if you can’t personally take a dog into your home? Volunteering for rescue takes many forms – you can help transport dogs, you can assist with fund raising, you can do home visits in your area, if you’re a trainer you can help rehabilitate dogs in need of re training, you can make sure your local shelters know about French Bulldogs and French Bulldog rescue – and yes, you can even foster dogs waiting for adoption. Why not take a few moments, and register to become a French Bulldog Village volunteer? It doesn’t take much time, and it will repay you in more ways than you can imagine! Heart is so cute, I would give her the whole bed, too! I donated in Lola and Sushi’s names. The idea of any animal suffering like that makes me feel ill.
Puppy mills make me sick. I am still amazed at how many people still buy dogs from pet stores, despite the media exposure. I work with a girl, her sister and husband run a pet store and get their dogs from Montreal. I hope this is the place that they use and that their business will be shut down. They are the same people who had the puppies with rabies at the fleamarket and thousands had to get rabies shots. Laws need to toughen up on these degenerates who run puppy mills. I say lets put them in a cage with no food or water or toilets. Leave them for a long long time. This is awful! I hope the dogs find suitable homes. Is Heart living full time with the Nellkins now? How is Penelope’s relationship with her, is she okay, does she treat her like she’s one of her kids or not? Does she try to breastfeed from Penelope? I’m really interested in all of that! Heart spends most of the day in with the Nellkins. Once or twice during the day, she nurses on Tula, and she sleeps with her still at night. So far, she hasn’t tried to nurse off of Penelope yet — I think she can tell she’s not her mommy. She *really* knows who Tula is — today, when Tula came near the playpen, Heart started barking and jumping at her. She doesn’t do that with anyone else. Penelope doesn’t seem to mind her being in there, but then again, she doesn’t pay much attention to her own pups anymore, either. I was trying out a new design.. as usual! I like the one I was recently using, but want to display more than one post at a time.